New work from an international team of researchers including Carnegie’s Lara Wagner improves our understanding of the geological activity that is thought to have formed the Rocky Mountains. It is published by Nature. 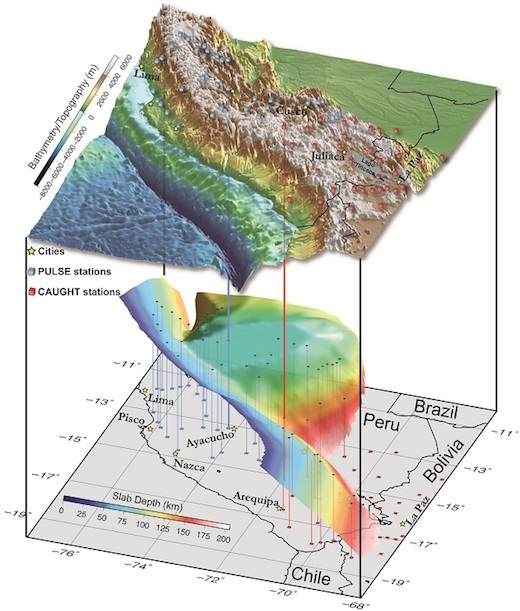 The revised geometry of the downgoing Nazca plate beneath the Andean mountains in southern Peru and northern Bolivia. Seismic stations are shown as colored cubes. Vertical lines show the location of these stations projected onto the slab. Image is provided courtesy of Lara Wagner. This work is suppored by the National Science Foundation.